Understanding sooting propensity of fuels is very important for development of future low emitting diesel engines and in recent times, becoming increasingly important for gasoline engines and gas turbines. In combustion systems, changing the fuels alter the combustion characteristics resulting in either flame instability or increased emissions including soot. There have been some studies on soot formation in diffusion biogas and ethylene flames but the sooting propensity of a wide range of the common groups of sustainable fuels including multiple fuel blends is still unavailable. Hence, detailed understanding of the sooting tendency of various sustainable fuels and fuel blends under changing operating conditions is vital. Development of novel optical diagnostics and tools – As a part of this study, novel optical methods for characterising soot will be developed. These tools would be utilized for the study of soot formation in various sustainable fuels. Additionally, these techniques will be calibrated to provide quantitative soot volume fraction. Application of techniques to laminar flames – Here, various sustainable fuels and fuel blend will be investigated to identify their sooting nature under the fundamental laminar flow conditions. Also, data from this study will help for the purposes of modelling – chemical kinetics and Computational Fluid Dynamics (CFD). Application to realistic flames – Since, most combustion devices operate at elevated pressure/temperature conditions and under turbulent flow regime, these techniques and measurement methods will be extended to study turbulent and high pressure flames for direct application to practical combustion devices. Ezenwajiaku Chinonso obtained his Bachelor’s degree in Mechanical engineering with a first class from University of Nigeria in 2011. Thereafter, he enlisted for the one year mandatory national service and subsequently worked for Shell Petroleum Development Company on contract basis for two years. He was awarded the Presidential Scholarship for Innovation and Development (PRESSID) by the Nigerian government with which he proceeded to University College London (UCL) for his Master’s degree in 2015. On completion of his master’s degree with a thesis on experimental investigation of the combustion characteristics of biogas as an alternative fuel, he joined the energy and environment group of UCL Mechanical Engineering for his PhD studies in 2017 under the supervision of Dr Rama Balachandran. 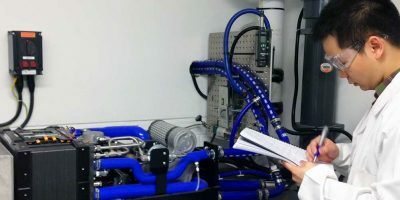 His research interests lie in the development of advanced optical diagnostics (laser) techniques for the investigation of the behaviour of particulate emissions (PAH and soot) of sustainable fuels under varying fuel compositions and operating conditions in simple and then practical combustion devices.